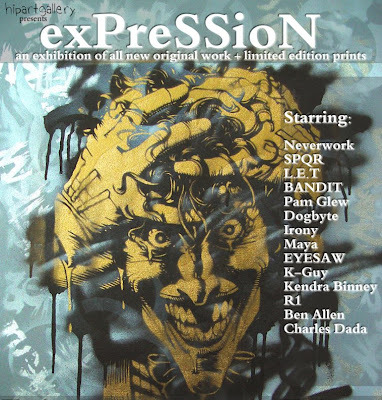 Online gallery Hipart take over The Brick Lane Gallery in East London this Thursday 4th September with a show titled "exPreSSion". The show will feature new original works and as with most exhibitions these days a selection of Limited Edition prints. Staring in the show are Neverworks, SPQR, L.E.T., BANDIT, Pam Glew, K-Guy and Ben Allen to name a few. The show has a preview night tonight the 3rd 6pm-9pm and the show will finish on the 8th of September. A preview of a selection of the prints available on the night can be seen over on the website here.